PRF's Facebook reaches 1 MILLION FOLLOWERS! In a wonderful display of global support for children with Progeria, 1 million people are following PRF through its dynamic and informative Facebook page. Follow and share so everyone can be part of our quest for the cure! In recognition of this milestone and all the people Sam Berns inspired, click here for “Take the Long Way”, a special musical tribute to Sam. We are thrilled to announce that as of 8 PM on March 3rd, 2015, The Progeria Research Foundation Facebook page has 1,000,000 followers – AMAZING! With your help we are spreading awareness of PRF’s mission across the globe, resulting in more supporters, more children with Progeria identified around the world, and more progress toward a cure. Please join our community on Facebook, and bring your friends along to share our message of hope for children with Progeria. 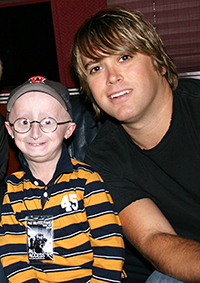 Long-time PRF supporter and acclaimed musician Pat McGee wrote “Take The Long Way“, a song in honor of his friend Sam Berns, who passed away from complications of Progeria on January 10, 2014. Recorded in just one take, the song features many of the original band members who knew Sam, as well as other legendary studio musicians who were profoundly moved by Sam’s story. Sam is heard playing the marching snare drum in the very beginning and end recordings taken from previously recorded home movies. HEAR THE SONG ON SOUNDCLOUD HERE, AND BUY THE SONG HERE. The lyrics, written in first person, are McGee’s interpretation of Sam’s infinite wisdom and love for his family and friends– some words are inspired from Sam’s recent TedX talk, the HBO Documentary Life According to Sam, and from heartfelt remarks spoken at Sam’s funeral by those who knew and loved him.